This one is a bit different from the typical book I would review here, but I think very highly of the author and many would enjoy Savage's stories as they involve the love of a literary life in some fashion. 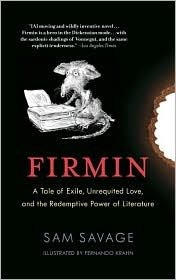 Sam Savage gained fame for Firmin: Adventures of a Metropolitan Lowlife, which was an endearingly sad tale about a rat born in a bookstore that is intelligent beyond his meager stature. Savage again takes up the reins of blending a love for the written word with a sad and lamentable character, but in the case of The Cry of the Sloth he has also created an ill-mannered logophile. Told through four months worth of letters written by the main character Andrew Whittaker, a small-time literary magazine Publisher and landlord of dilapidated apartments is a supreme ne'er-do-well. If Whittaker gets involved in anything it is sure to crumble to pieces. Whittaker is on a downward spiral into loneliness and madness as he laments where his life is while being chased by his tenants who are tired of apartments infested with rats and roofs caving in. 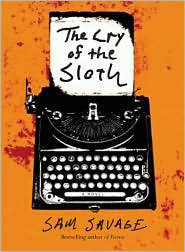 It takes a few chapters/letters to get into the style of The Cry of the Sloth, as the tone and often the truthfulness of the letters is seemingly rambling or unrelated. Yet that is often the point and once you get into the meat all the pieces start falling together with cringing laughter. There is a surprising amount of action given the style, but Whittaker's run-in with the local literary community and his attempts at organizing a literary festival more than keep things going. His letters to the local paper were my favorite sections, especially the pseudonyms he created. Often sad, yet humorous The Cry of the Sloth is one to pass on to friends. I give The Cry of the Sloth 9 out of 10 Hats. Savage has established himself an original niche of short but deep books for lovers of the written word that stay with you. Do yourself a favor and check out his Firmin or Sloth. In the end I did like Firmin more, but that mostly had to do with the character Firmin being so charming and it being set in a bookstore. Thanks for the heads up on Savage. His books sound really good. I'll have to check them out soon. Savage is one of the most original authors I've read in a long time. I say start with Firmin though.